Appearance: Very light straw golden pour. Nose: Very rounded nose, hints of subtle pines, butter, tender agave, and vanillad oak. Overall, it’s extremely smooth. In the very back end of the nose there is a tiny element of booze, letting you know it’s there, but making sure you also know how refined this product is. Palate: Again, extremely smooth overall. Light hints of butter blended with tip of the tongue. It’s not anagave and hints of cacti in general. There is a spice prevalent, but is well built in to the entire flavor, which is refined so well, that it’s fairly amazing for the price of this bottle, which sits around $50 in California. Finish: You receive a light caramel based blast and finally the peppery spice you’re used to with a tequila becomes present and sits around the tip of the tongue. It’s not an overwhelming finish, but it’s polite, and compliments the rest of the drink. Good stuff here. Overall: 17/20 : This particular Anejo provides a clear look into how smooth an excellent tequila can really be. If you’re looking for something not too daring, as in spicey, in the fine tequila depart, that won’t blow a hole in your pocket, this is a fine option. Great enough to definitely not make with a mixed drink, the Manana is something to be served straight and enjoyed slowly to soak in the flavors of refinement. Appearance: Light straw with a hint of maple. Nose: On first pour out of bottle you receive a huge blast of pepper spice, almost daunting in the nose. Pepper pepper pepper. After we let the sample sit for 20 minutes, it mellows out into smelling more like a light sugar cane with some hint of a steely presence. And it’s not a bad thing, rather enjoyable at that. Palate: The pepper you get from the nose moves to the back end, we’ll discuss that more in the palate section. The body of the Oro has somewhat of a refined maple syrup aspect buried beneath the layers of pepper that continually hits you over and over. It’s almost difficult to gain much of anything else from this on the palate except pepper. What’s interesting is that if you let the sip sit on your tongue, it’s nothing but smooth, but once it’s pepper for days. Finish: White pepper. Lots of white pepper. Hints of spicey nuts that last all the way down the throat. There’s elements of the soft agave in there, but it’s fairly buried underneath the spice. A pour right from the bottle sampled is almost the exact opposite, flaunting the buttery fruit elements over the pepper. Overall: 16/20 : There is more of a complexity than refinement to this than the Manana. If you let this product sit our and oxygenate for 20+ minutes, it will actually develop other properties, where the Manana sits as it does. 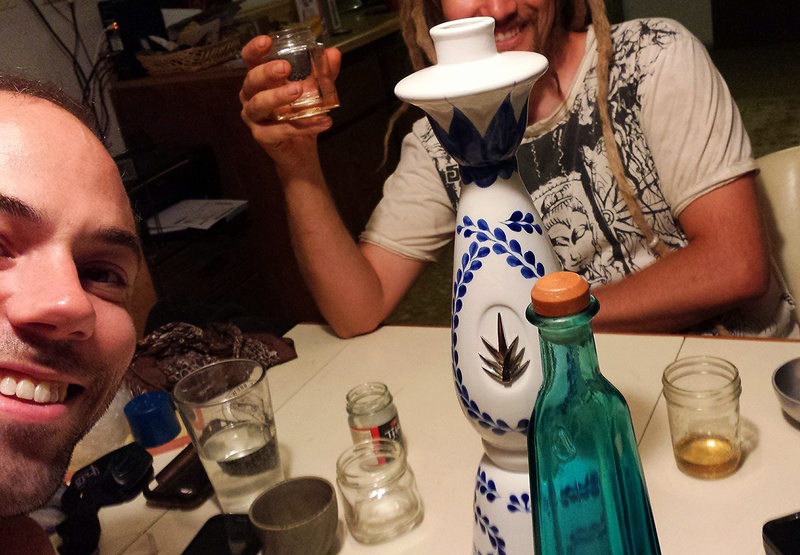 This particular product has elements of different classifications of tequila all smashed in to one bottle. Bang for your buck – this is a great choice. Appearance: Comparatively to the other products, there is the golden straw color, but also present is a deeper amber hue. Nose: Rich. Rich. On the nose you’re going to smell plums, soft agave, refined sugar, and maplely soft cola nut aspect. There is no burn. It’s just happiness. Palate: Soft sugary agave up front. The body is smooth. You don’t even want to swallow. Let it sit on your palate. There is no burn here either. It’s like pouring maple syrup right out there tree, that’s been refined to the finest extent, so that no bi-product is able to pass into the flavors, making it as simple and perfect as possible. Hints of vanilla, cognac, and sherry are all present, but undeniably built so well into the body that you can’t really pick apart all the different flavors. It’s a blend, it’s amazing. Finish: Ultra smooth, hints of nuts on the almond tip with maple buried underneath. Butterscotch. There’s elements of vanilla from the oak, but no oak. Elements of cognac, but no burn. It’s hard to wrap your brain around how perfect this product is, but, it just is. Candied sugar. Almost a hat’s off to the perfection the Belgian’s reach with their candied sugared beers. Fantastic. Overall: 19/20 : This is in a class of it’s own. It sits in cognac, sherry, and bourbon barrels for a while before being blended into it’s refined smooth presentation you get when you pour it from the bottle. At an asking price of around $90 in California, this is definitely one of the more intriguingly perfect bottles of tequila you can buy for this price. Excellence at it’s best. I highly suggest doing some further reading on this particular product. It’s one of the world’s best, and for specific barrel-aging reasons. They let this sit in sherry, cognac, and bourbon barrels before blending them all and bottling it for the shelf. Not many other tequila’s go that far in geekery to achieve this excellent of a flavor. Each bottle is hand-painted and number, complete with a ringing bell as the cork! Get this when you can afford it!! 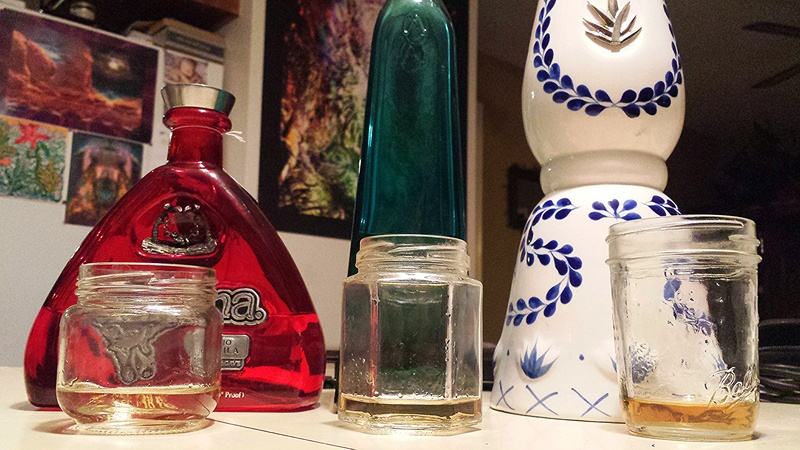 The above photo provides a clearer look at the appearance of each pour. Not too much variation, but the extra barrel aging on the Clase Azul definitely shows up in the color. 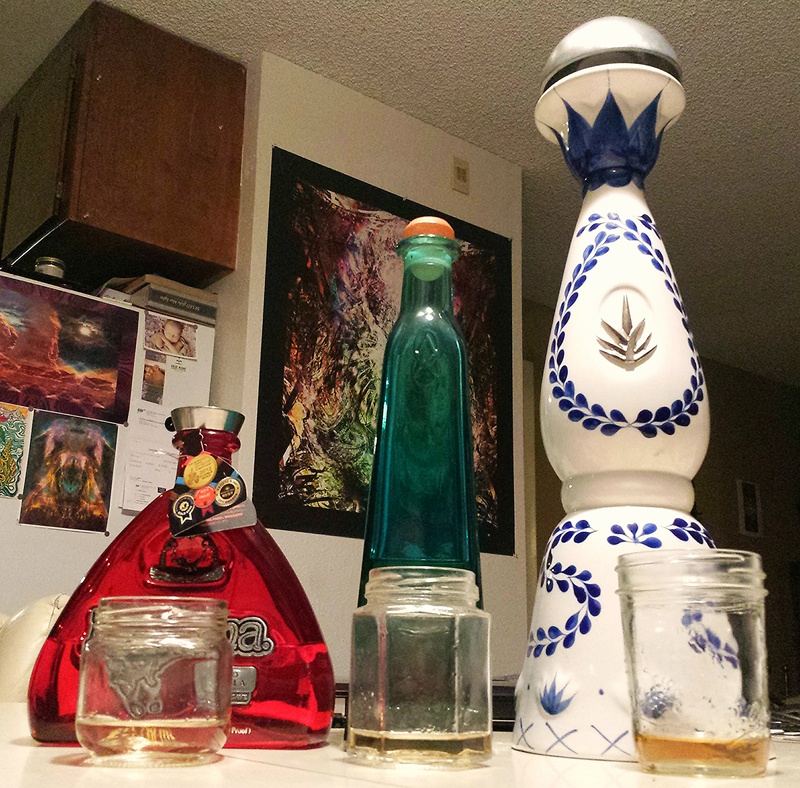 This concludes my first tequila write up…I hope this inspires some fine drinking, and if any of you have another fine tequila recommendation, please send it over! Can e.Mail me directly at: skoinfinite @ gmail dot com . Thanks!